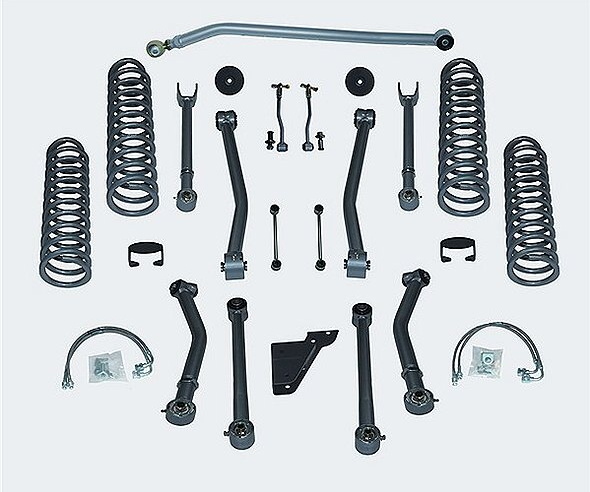 The RE7143 3.5-inch Super-Flex suspension system is for enthusiasts looking for the best short arm suspension system that retains the factory mounting locations. The 3.5 Super-Flex system features great ride quality and phenomenal performance. 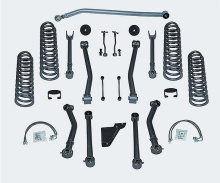 Features include new Rubicon Express adjustable upper control arms and fixed lower control arms with our Super-Flex spherical ball joints, replacement lift springs extended bump stops, longer front stainless steel brake lines. This suspension will allow the use of 35" tires. NOTE: Front and Rear driveline modifications may be required. WHEEL RECOMMENDATIONS: 8" or 10" wide wheels with a 4.5" backspacing. RE1530 - JK FRONT BRAKE LINE SET-24"
RE1540 - JK REAR BRAKE LINE SET - 20"